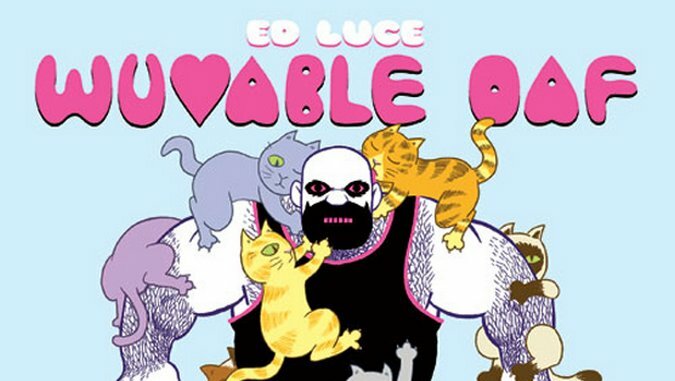 Originally self-published with the help of a Prism Comics Queer Press grant, Ed Luce’s Wuvable Oaf centers on the titular Oaf: a large, hairy, gay, former-pro wrestler. After retiring from wrestling, Oaf spends his day running a kitten orphanage with his dad and fawning over impish men he sees on the street. Though it contains fantastical elements, the series is mostly a straightforward romance tracking Oaf’s involvement with Eiffel, the lead singer of heavy-metal band Ejaculoid. The series is rendered in stark black and white, with some textural shades of gray, and Luce’s strong authorial voice is present in every panel. His use of spotted blacks creates a heavy contrast between expanses of negative space, and forms and figures are largely defined by the interplay between those spaces. This stylistic identifier recalls the complex patterns of Mondrian—more in function than in form—and the result is a natural engagement of the eye; both artists utilize clear discernment to emphasize and deemphasize features (in Luce’s case) or notional concepts (in Mondrian’s). To further the comparison: both artists prudently utilize shortcuts that thin the mediation between their work’s intent and its affect. The totality of Luce’s illustrative aesthetic is derived from this seemingly simple attention to definition—the bulk of Oaf’s body, clothes, beards, eyes, idiosyncratic physical features are all visible and readily identifiably, but only though the contrast of black and white. The ubiquitous cats that populate Oaf’s life are all emotive blobs of ink (or the conspicuous absence of it), and they slink and skitter across the page. The utility of the Mondrian comparison is finite, though, and Luce is more interested in texturing his concrete forms. Body hair erupts from every pore on Oaf’s body, and the prickly, scratchily marked coat is a running gag Luce rings often. His ability to richly texture the body allows the book some of its most jaw-dropping/speechless moments; his ability to sell you on the tactility of his otherwise-stylized flesh and hair is affecting. Watching, for example, Oaf scarf down an insurmountable heap of haute cuisine that we’ve seen…tampered with, shall we say, is absolutely disgusting. That’s the point, though, and Luce impresses at every step with his ability to hit the mark so precisely and so accurately. 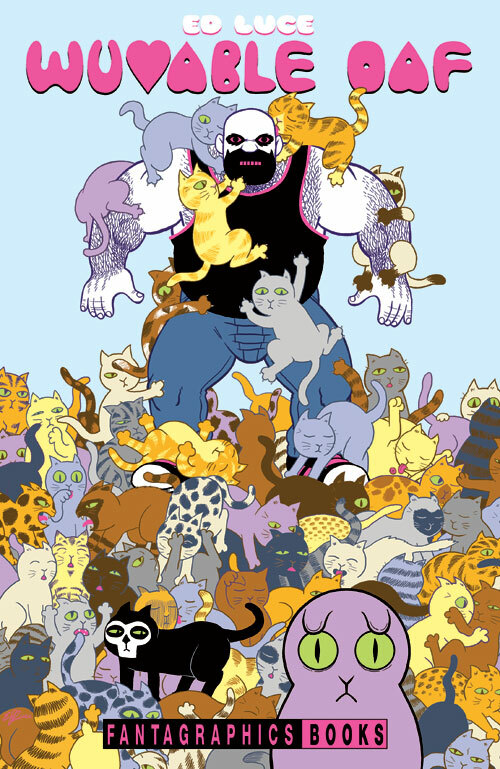 But while Luce’s aesthetic and storytelling impress, it’s Wuvable Oaf’s story that’s endearing. Luce is able to instantiate all these deeply felt universals, and make personal that which is general. Oaf’s relationships feel real and have the patina of autobiography. I’m not sure if it is the case, but the stories certainly feel like Luce is mining someone’s life for material. The ups and downs and humorous pratfalls that plague Oaf are all things that anyone—regardless of gender or orientation—who has been in a romantic relationship can empathize with. Luce goes small so that his book can go big. The awkwardness, the tenderness, the eroticism, it all comes from a truthful place, a recognizable place, and it’s what makes the series both as funny as it is and as touching. However, it’s important that we not ignore the fact that Luce’s characters are openly and explicitly gay. This is relevant and noteworthy because gay characters in comic are even more uncommon than they are in other media, which is to say that comics fails to hurdle an exceedingly low bar. And when we do get gay characters, their sexuality is usually ancillary to their identity—a beat/line/scene that exists to tick a box, and then that aspect of themselves is typically never visited again. So a character that’s not only gay but whose sexuality is part and parcel of how they navigate their life is kind of a big deal. It’s vitally important to recognize not only the complex identities of Luce’s characters but to also recognize that he offers a spectrum of gay characters. The community of people that Oaf exists in is made up of all kinds of different people—different heights, weights, ways of dressing and grooming and expressing themselves, as well as different attitudes and dispositions. Unfortunately, gay characters who are actually characters and not just cyphers are a doubly rare, so Luce’s ability to render each of these people with a unique personality is important to lionize. While this collection of Wuvable Oaf doesn’t quite complete the story of Oaf, Luce, in his recent Inkstuds episode, hinted at a possible follow-up collection which would continue it. While it would be interesting to see Luce apply his confident style to another story or character, more of these characters (whose rich backstories are elucidated in the extensive Marvel Handbook-style backmatter) would certainly be welcome.